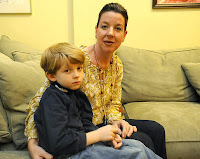 "We just got a diagnosis of high-functioning autism for our 6-year-old son. My husband and I are having two very different reactions to this recent news. I'm rather relieved to know that our son doesn't have a more serious problem (relative to other disorders like bipolar, which is what we suspected originally), but my husband views our son's behavior as "rebellion" and "laziness." How can we support our son, but not let his "disorder" be an excuse for behavior problems or lack of effort?" Some parents remain in that stage and can't see the positive aspects their child brings to the family and the world in general. Other parents are relieved to know that there is a name for the "difference" in their child and that this "disorder" has nothing to do with "bad parenting." Those parents that choose to see what their child can bring to the world will begin to be an advocate for him or her with those who understand less about the condition than they do. When parents become their child's greatest advocate, others can interact with the child in a more informed way -- and the child him/herself will experience life in a positive dimension. The road to becoming your child’s greatest advocate begins by being as informed as possible about the condition. There are dozens of books, some more scholarly than others, that parents can read to help themselves understand that this disorder was not their fault and to learn patterns of behavior they have come to see in their child but didn’t know what they meant. The second part about being an advocate is to pay careful attention to him or her. Learn your child's idiosyncrasies and pay attention to the things that work for him or her, along with the things that don’t work. If the child has certain obsessions or compulsions, understand what they are and find out ways to get around them, if needed and if possible. The most important people to be your child’s advocate with are your family, including your extended family, daycare providers and teachers. They need to be as comfortable with dealing with your child as possible. Teachers and even daycare providers need to know how best to teach the child and how to handle tantrums or behaviors that can be hard to control. When these types of people understand the child, it often makes the difference between a good education and a poor one for a child that most likely has the potential to do just as well -- or even better -- than his or her peers. • Anonymous said... it took me a long time to come around to the realization that my son had aspergers. I thought he was just stubborn and wasn't getting the best people around him. My husband was more concerned that he was autistic than I was. I didn't really know what Aspergers/HFA was. Now that we are on the same page, everything is going along ok. Still dealing with son's behavioral issues but it helps to be on the same page. • Anonymous said... my advice......get counciling for the two of you....you need to be on the same parenting page with this. • Anonymous said... My daughter was also diagnosed at 6 and I see it as a gift. She is so special and not generic like the other kids at school. I have great support at her school and they also wouldn't change her for the world. Since finding out I truly understand her and we don't call it a disability it's her special gift. She is very artistic and loves to paint and create so we do a lot of that and it helps her in other aspects of life. What does your son love to do? • Anonymous said... My son's doctor gave me the best advice- he said: "You have to wrap your mind around his, don't try to get his mind wrapped around yours." • Anonymous said... Once my son was old enough to really understand Aspergers and do some of his own research, I explained it all to him. And I made it very clear this was NEVER to be an excuse to not excel in life. He's 15 and doing great. The issues are there, but we all manage and understand them better and he is treated no different than any of the kids (he is the oldest of 4 boys), with the exception if things like clothes and specific pencils he must use, etc. He is expected to get decent grades, have chores, be responsible. He has his driving permit now and shows more and more awareness with each drive. You will see many changes over the years...just treat him equally with the minor changes he requires to fit HIS world. • Anonymous said... Strongly recommend a parenting support group for both of you! Hearing my son's diagnosis (also HFA) was terrifying for me. Hearing other's stories was VERY helpful. • Anonymous said... This is very common, my suggestion is that you and your husband will need to learn how to communicate to each other. You will both need to learn how to be very honest and open with feelings, emotions and parenting ideas. You will need to find a parenting style that you both like that suits the child as they need different parenting skills to a normal child. They need better explanations on what and why they were naughty. Look up social stories, they help autistic children to learn most situations. * Anonymous said... We're just starting down this road too. We're doing the 'research, research, research' that someone mentioned above, but we're trying to do it together, for example one of us does the dishes while the other one reads out loud from whatever book we're currently working through. That way we can talk about it as we're coming across things that are new to us, like the idea that meltdowns can't be 'disciplined' in the same way that rebellion or disobedience should be. We're in the process of working out what the triggers are for our daughter's meltdowns so that we can be more aware of how she's likely to react to things and therefore try to minimise her reaction, but also so that we can talk to her about the way she felt (after she's calmed down) and begin to give her other more acceptable ways of dealing with sensory and communication problems. I think the key ingredient is going to be time and perseverance, and an openness on our part as parents to see the world from our child's perspective rather than our own. All the best.